While Kiama Council awaits funding for assessing the best way to manage the dunes at Jones Beach, it appears some individuals have taken it upon themselves to rid the beach of many of its well established banksias and other vegetation. compared to the Google Earth pictures (right) taken in February 2016. It also captures two men not associated with Land Care working in the area. “It appears people have decided to take things into their own hands,” says Council’s Director of Engineering & Works, Gino Belsito. While some of the banksias might have died naturally, others might have been the victims of long term spraying. “I haven’t been able to substantiate anything, and no-one has seen anything, which is very unusual. He warns the penalties could be up to $1 million for widespread clearance. He is considering deploying infra-red surveillance cameras at poisoning hotspots. Councillor Andrew Sloan has described the poisoning of the banksias as shameful. “Halfway along Jones Beach all the banksias are suddenly dead. I am so angry to hear that this seems to have been a deliberate campaign to poison all trees at the Northern end of the beach. As reported in The Bugle last year, opinions differ as to the best way to care for the beach’s long term health. The BeachCare Kiama group wish to follow the initiative taken in Woonona and other northern beaches that involves lower density planting. On the other hand, The Greens advocate planting a sequence of primary, secondary and tertiary plantings that rise in height and mimic the natural zonation of dune vegetation. 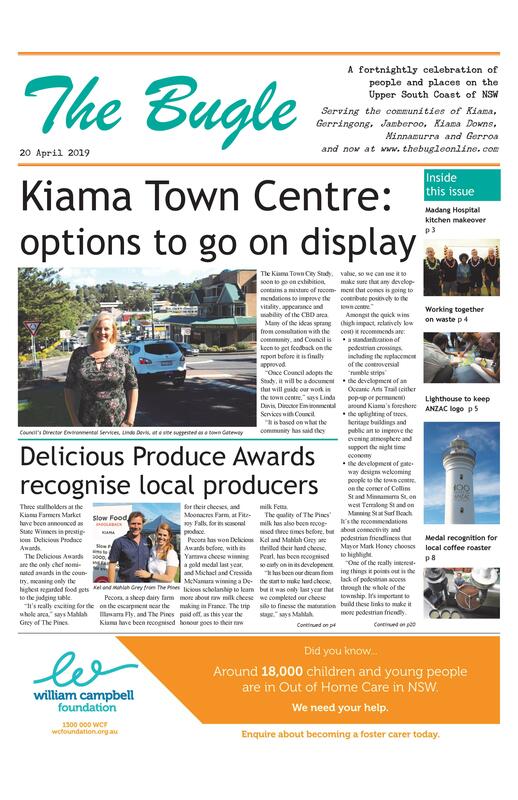 Faced with these opposing views, Kiama Council has applied for a grant to get expert advice on the best way forward. “We are very hopeful of getting funds from the Office of Environment & Heritage,” says Mr Belsito. While the prospects of getting a grant seem good, it could be months before the funding is secured, and then the consultant’s work is expected to take 10-12 weeks. In the meantime, a Land Care group, led by Mark Hume, has taken on the role of clearing lantana and rubbish from the dunes. The Land Care group are easily identifiable, wearing Kiama Council volunteer fluoro vests and working two sessions a month, on the last Sunday and the second Tuesday, 9.30-11.30am. “If you see anyone outside of these times and without a vest, contact the Ranger,” he says. Kiama Greens’ Jodi Keast, who lives a street back from the beach, says she has noticed trees dying over the last six months. In seeking to document the state of the dunes, she commissioned drone footage of the length of the beach in mid June. When she viewed it later that night, she saw it captured two men in white shirts doing unauthorised work at the northern end of the beach. She wants to know what Council will do to replace the unauthorised removal of vegetation at the north end of Jones Beach and the poisoned trees in the middle section. “That northern end of the beach is just bare now. Council needs to go and plant there straight away,” she says.